The arrival of light rail brings many changes. What will LRT do to property values, established neighbourhoods, and the vibe of downtown? That’s the multi-million-dollar question on the minds of everyone from developers and city planners to homeowners. When Stage 1 of Ottawa’s light-rail transit (LRT) line opens in 2018 and Stage 2 opens in 2023, will Ottawa magically turn into a denser, livelier city? Or will the city become a thicket of half-empty condos and neighbours angry about living in their shadow? How will the changes affect pedestrians and drivers, students and seniors, the well-heeled and the disadvantaged? And — of critical importance, if cocktail-party chatter is any guide — what will the LRT mean for property values? The short answer to all these questions appears to be: it depends. In particular, it depends on what kind of real estate is built around the stations, how we address the needs of current and future residents, whether established neighbourhoods embrace change, and what sorts of policies we put in place at city hall. Oh, and if the trains run on time, that will help. The predictions are certainly enticing. 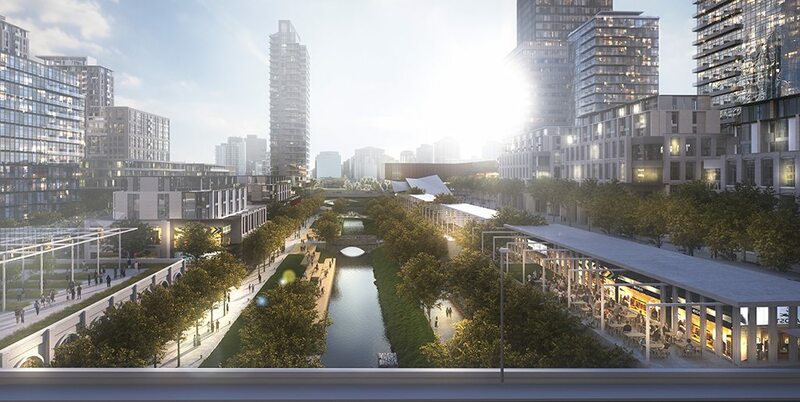 In illustrations submitted by RendezVous LeBreton (RVL), which is developing the western section of LeBreton Flats near the future Pimisi Station, and Claridge Homes, in charge of the eastern half, people stroll along tree-shaded plazas flanking an aqueduct spanned by heritage bridges. Below the plaza, an LRT train glides by. In the distance, the new Senators arena glows in the sun. Soaring condo towers, glassy office blocks, and shiny shops stretch to the horizon. An illustration by Rendezvous Lebreton shows a pedestrian-friendly vision for the area between Scott Street and the Canadian War Museum. And that’s just the area around Pimisi Station. Every week seems to bring news of other proposals, such as the cluster of huge towers for Bayview Station or RioCan’s plan to redevelop Silver City near Blair Station. Is there really enough demand in Ottawa for all this? John Smit, acting manager of policy planning and acting director of economic development for the City of Ottawa, is cautiously optimistic. After all, our population is forecast to grow from 912,250 in 2011 to 1.15 million in 2031. However, the city isn’t going to turn into midtown Manhattan overnight. Many proposals have timelines of 20 years or more. Historically, between 5,000 and 6,000 new housing units are sold (or “absorbed,” to use real estate lingo) in Ottawa annually. Given that fact — and Ottawa’s glut of unsold condos, which does appear to be easing — caution seems wise. The long timeline also reflects the very human tendency to resist change. One of the reasons we haven’t seen development on this scale around transit stations in the past is that residents protested vehemently when densification began to rear its contentious head in the 1980s. The city eventually limited development, particularly in established neighbourhoods such as Westboro. On the other hand, those who would like to move to those established areas but can’t currently afford to do so may have some reason for optimism. For instance, the Centretown Citizens Ottawa Corporation (a non-profit organization that manages housing for low- and moderate-income people) is a partner in the RVL proposal; that plan includes 1,100 affordable housing units on LeBreton Flats. That will put a small but welcome dent in the city’s waiting list for affordable housing, which stood at some 10,000 households in late 2016. Suburban empty nesters may also be cautiously hopeful. Many want to free up cash by moving to a smaller property without stairs. However, if the available condos cost as much as their current digs — and they have to pay land transfer taxes and condo fees — the Freedom 55 set may just stay put, says blogger and former Transport Canada planner Eric Darwin. 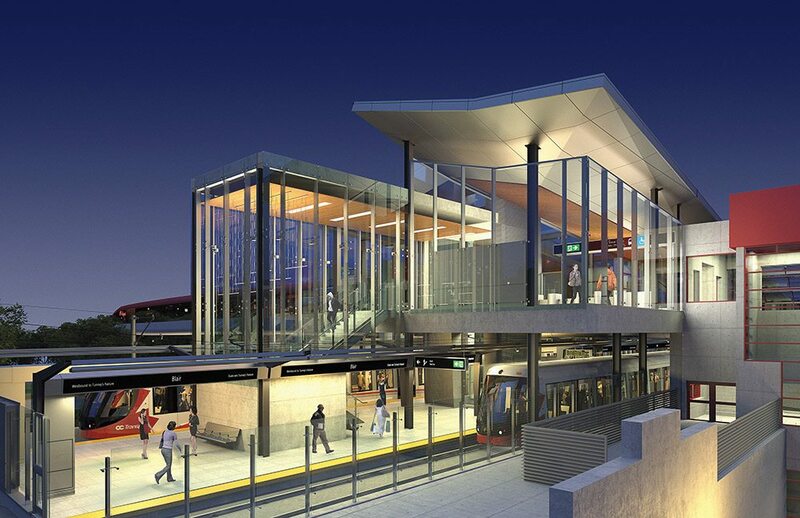 So here’s another big question: How will the LRT affect Ottawa property values? In general, values rise around rapid-transit stations, says Rachel MacCleery, senior vice-president of the Urban Land Institute, a think tank based in Washington, D.C. However, she cautions, “A lot of the property value effects will depend on how much of an improvement in service and quality, reliability, frequency … happens as a result of the light rail.” The bottom line is that transit development doesn’t just happen; maximizing the value of transit takes a concerted effort. 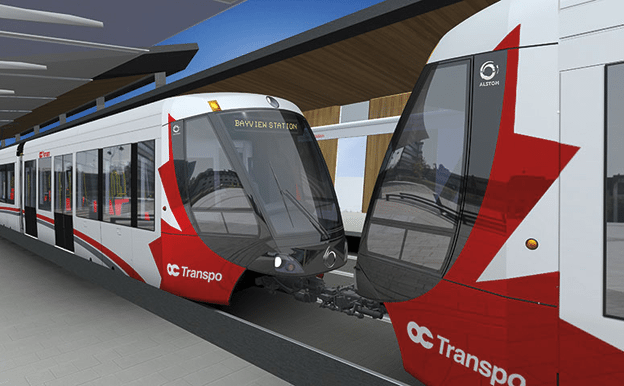 OC Transpo estimates that the LRT will eventually shave five to 15 minutes off the average commute. Studies have shown that the average distance people are willing to commute in major cities hovers around 30 minutes, so even a five-minute difference could make a neighbourhood more appealing to homebuyers. The city is encouraging office development around LRT stations as a way to ensure that the trains are used throughout the day, and not just at peak commute times. Here’s the catch: If those efficient trains are mainly funnelling suburban workers into downtown, they’ll be packed on their way downtown and virtually empty during the day. However, if people are getting on and off the train throughout its route, the train will be less jammed at any particular point. That might make transit more appealing. If ridership rises, it is economically feasible to run trains more frequently. That’s one reason the city is encouraging office development around LRT stations across the system. So if we build these dream communities of tomorrow, will enough people come? Maybe — if we can make them economically feasible for empty nesters, if traditional neighbourhoods embrace change, if companies lease offices outside the core, if developers build a range of housing stock, and if city rules make all that possible. And, yes, if the trains run on time.